ARTS & CRAFTS HANGING / TABLE TOP OIL LAMP BY LANCASHIRE ARTIST M. STUNNING ARTS AND CRAFTS HANGING / TABLE TOP OIL LAMP. A rare opportunity to acquire this superb Arts and Crafts hanging oil lamp which cleverly converts to a table top model. We believe that this lamp is attributed to the Lancashire artist Marshall Vernon Brown 1876 - 1945, although it is unmarked. The skill in the metal work is fabulous, we believe the metal to be copper with a'bronzed' finish. The wrought, twisted design is further enhanced by the planished smoke catcher, hanging boss and font holder. The polished brass font sits neatly into the holder which as you can see in the photographs is integral with the scrolling design which forms the legs when used as a table lamp. It is a centre draught burner with a clear glass centre draught chimney. The satin etched glass globe is by Vianne, a good quality replacement reproduction shade which complements the oil lamp beautifully. 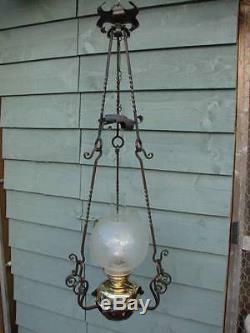 The oil lamp from hanging hook to the very base when in its hung formation measures 1m and 6cm. As a table lamp it stands 52.5cm to the top of the chimney. An approximate base diameter at its widest point of 34cm. A rare opportunity to acquire this fabulous piece of'art work' in the form of an oil lamp to add to your collection or as a prestigious addition to your interior. Please look carefully at the many photographs to fully appreciate and satisfy yourself to condition and style. Thank you for looking and please view our other quality listings, including many other oil lamps, parts and accessories. We aim to sell quality authentic antiques and collectibles to the discerning customer. Please be sympathetic to the fact all of our items are used, sometimes for hundreds of years! International buyers please be aware that we only post. This is to ensure your item is delivered safely and in good time. For items weighing 2kg and over or large items we use. Parcel Force Worldwide Global Priority. This is a tracked service. We will provide a proof of posting certificate to support any personal claims you may initiate with the Post Office regarding your item should it be lost or damaged in transit. These charges are the buyers responsibility. We are happy to answer any question or offer advice on our items please feel free to contact through the designated messaging service. The item "ARTS & CRAFTS HANGING / TABLE TOP OIL LAMP, ETCHED SATIN GLASS GLOBE SHADE" is in sale since Wednesday, February 18, 2015.